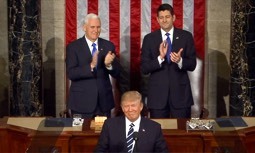 WASHINGTON, D.C. 3/1/17 – Last Night, President Donald Trump gave the most unifying 'Address to Congress' ever to be heard. He put his arms around both sides of the aisle asking that all work together for a better America. He was totally presidential both in tone and content. He spoke to America – ALL of America, and even at this early stage of his presidency, he has fulfilled every promise he made.There is no question that he will fulfill all the rest. He received numerous standing ovations and cheers. Especially when he introduced Carryn Owens, the widow of recently killed Navy Seal William 'Ryan' Owens, who died in Yemen. It was the most touching moment of the evening as the grieving widow, who obviously was very much in love with her husband, could not hide her emotions. When introduced, she receive an over 2 minute standing ovation, then later a second one. The only ones in the house who did not stand to honor her was Debbie Wasserman Schultz and Keith Ellison, the active Muslim in Congress who wanted to be head of the DNC. This prominent display of dishonor from two enemies of America was not a shock. As also to be expected, the liberals, who want only a Communist controlled tyrant to lead our country responded immediately with their jabs: Today's AOL news headline read: 'Trump Address Inspires Groans from Lawmakers.' How did that so-called journalist come to that conclusion? John Stewart's headline was: "Two words reveal when Trump is lying." He failed to point out WHAT President Trump lied about. And there were more. Those hacks worked hard in an attempt to totally misrepresent what actually took place at the Congressional Address. This is natural for democrat 'news' writers. Ever notice how close the word, 'democrat' is to demonic? The worst came from that blubberish accumulation of noxious ectoplasm, filmmaker Michael Moore, who called President Trump "sick" for hosting Carryan Owens, the widow of the Navy Seal killed, and called this grieving woman, now get this, "an idiot." And why? Because she allowed herself to be used by Trump, Moore postulated. Now hold on. After that, President Trump went on to pay tribute to all our service men and women and vowed to improve their VA hospital care and benefits, calling them all heroes. Readers will notice that this is a very politically correct column. We did NOT call Michael Moore F A T.
A group of feminists were sitting together wearing white to call attention to themselves. The white, they explained, is to protest the treatment of women by Trump. What? This man has given more women executive power than any other businessman on earth. Women like this are the reason for twin beds. Ruth Bader Ginsburg, a Supreme Court Justice, was, as she promised, a no show. What is her problem? It is a DUTY of Supreme Court Judges to be present at all such leadership functions since they represent the law of the land. There is no excuse acceptable for her absence. Then again, she was filmed dozing off during an Obama speech. At least she graced Obama's speech with her royal presence. It is not certain if she snored since it was unknown which end the sound came from. Nancy Pelosi displayed such a surly plastered look that she must have been weaned on sour pickles. She sat so stiffly, that she resembled a display in a wax museum. She has no class. Interesting, Pelosi could have been an attractive woman but chose to be otherwise. Pity. Last night, Donald Trump was indeed, President Trump. He offered a sincere olive branch to both sides of the aisle and gave one of the greatest presidential addresses in history offering optimism for a country set in the midst of a violent world, giving hope to the world itself. Who could have asked for more? Best of all, he gave us all hope. This is something we have all longed for throughout the past several years. But like the criminally insane in the asylum who screamed and yelled when a spirit filled Christian walked through (described in a previous article) the liberals will scream and yell every time something hopeful takes place. And that explains the distorted headlines in today's papers. And it also explains that asinine "democratic response" to President Trump's address by former Governor Steve Beshear of Kentucky who gave the dumbest response that could have been given. He talked much, but said nothing. The Beshear family lived down the road from where relatives lived in Sturgis, Kentucky. It was a family of uneducated hillbillies, so this came as no surprise. We must back President Trump all the way, and insist that Treason and Sedition charges be filed against George Soros.